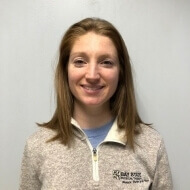 Liz is a native of the South Shore area and earned her Doctor of Physical Therapy (DPT) degree from the University of Massachusetts Lowell. Prior to this, she earned her B.S. degree in exercise physiology. Liz has experience evaluating and treating musculoskeletal conditions of all different types. She has been designated as a Board-Certified Orthopedic Clinical Specialist (OCS) by the American Physical Therapy Board of Specialties. Liz enjoys her work as a physical therapist immensely. She is passionate about continually advancing her education so that she can provide her patients with the most current and effective treatment interventions available. Liz is a former high school and collegiate cross country and track and field runner. She continues to enjoy running recreationally today.